Folks who only know me from this blog may be surprised to learn that I primarily studied German history in graduate school. It’s hardly obvious – I’ve only reviewed one other German movie since I started. In fact, although I’m interested in German history and film history, I consider most German cinema to be pretty mundane, with an unfortunate emphasis on “realism” over visual and dreamlike aspects. When we get up to the Expressionist period, that will change, but only for an all-too-fleeting moment, I’m afraid. 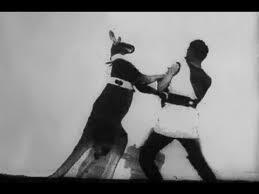 In the meantime, though, we might as well spend April Fools’ Day with one of the sillier German Century Films: “The Boxing Kangaroo.” I believe that “boxing” kangaroos had been a common feature of circuses prior to this time, but here is one captured in motion pictures. The kangaroo is dressed up and given boxing gloves, and has to defend himself against a mustachioed human boxer (who wears no gloves). The film seems to consist of three “takes,” either because the film strips were very short or because it was hard to keep the animal “fighting” for more than a few seconds at a time. The kangaroo clearly doesn’t understand (or care about) the rules of the sport, he just wants that silly little man to stop hitting. SPOILER ALERT: The kangaroo wins. I have attempted embedding it above, if that doesn’t work, you can watch it for free: here.